Mayor Gregor Robertson said regulations are designed to protect and free up rental housing in response to a critically low vacancy rate. Vancouver Mayor Gregor Robertson speaks during the North American Climate Summit in Chicago, Illinois, Dec. 5, 2017. VANCOUVER — The city of Vancouver is moving to legalize short-term rental accommodation like Airbnb but operators will only be able to advertise their principal residence. 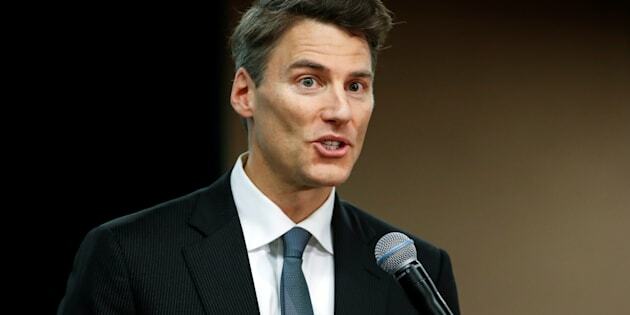 Vancouver Mayor Gregor Robertson said Wednesday that new regulations to be enacted next week are designed to protect and free up rental housing in response to a critically low vacancy rate. "The goal of the city is to restore some of our long-term rental and take a balanced approach, making sure we are protecting rental stock at the same time that we're enabling supplemental income for people who are using Airbnb and other short-term rental platforms,'' he said. There are roughly 6,600 short-term rentals posted online, and more than 80 per cent will remain legal under the program, city officials said. A woman talks on the phone at the Airbnb office headquarters in the SOMA district of San Francisco, California, Aug. 2, 2016. Operators will be required to apply for a business licence by Sept. 1 and include that number in their listing, which Airbnb has agreed to make as a requirement on its platform. Secondary suites can only be listed on the platform by a long-term resident of the unit, and city staff say there are about 1,000 units currently listed that are not an operator's primary home. Robertson said most of those units should go back on the rental market or be subject to a $1,000 a day fine as of Sept. 1. Airbnb spokeswoman Alex Dagg said the agreement reached with the city, which also requires the company to share quarterly data and user contact information, is the first of its kind in Canada. She said other jurisdictions globally have implemented a similar partnership. She said the information being given to the city will help enforce the new regulations, while allowing users to continue to list their homes with ease. The city's general manager of development, Kaye Krishna, said about 88 per cent of all online short-term rental listings are posted on Airbnb. Other platforms are in negotiations with the city, Krishna said. The Expedia Group, which owns the platforms VRBO and HomeAway, has agreed to educate users on the new regulations and encourage them to obtain licences, she said. The cost of the licence is $49 annually, and operators must have permission from their landlord or condo board and adhere to fire and safety standards. The city has set up an online application, which Krishna said takes only minutes to complete, that will launch next week. The city has hired bylaw enforcement officers to monitor violations and issue tickets. "Housing here is for homes first and be used as a business after that and be taxed as a business appropriately,'' Robertson said. The new regulations, paired with the city's recent empty-home tax, are "tools that can boost the supply of long-term rental, and again, make sure we are getting the best use of our housing stock across the city,'' he said. The city's vacancy rate is currently at 0.8 per cent, Robertson said.